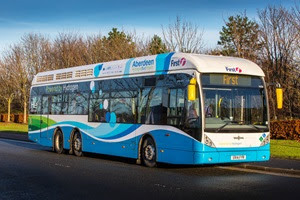 Figures from FirstGroup demonstrate an expanded use of latest-generation bus engines and alternative fuel sources across the company’s fleets in 2016. Over the past 12 months, the transport operator has increased its use of alternative fuels, such as biodiesel, gas, and electric engines. The company has also ramped up its investment in Euro VI bus engines in the UK. The six months between April and September 2016 saw a 14 times increase in mileage driven on these greener engines, when compared to the same period in 2015. Euro 6 is the latest generation of diesel engine and generates only one eighth of the harmful nitrogen oxide emissions produced by Euro V engines. Jim Harbidge, Group Head of Environment, said: “The volume of alternative fuels we use – in comparison to standard fuels – is growing every year; a change which is supported by increasing demand for greener alternatives from our customers and passengers. In the company’s North American businesses, alternative fuel usage increased by almost 3% in the first half of the 2016/17 year. During this period, more than 63 million miles were travelled by vehicles running on biodiesel, gas, or electricity. The company also saw 45% growth in liquefied natural gas mileage (LNG) and 22% increase in liquefied petroleum gas mileage (LPG), when compared to the same period in the previous year.